Locals are asked to save fruit pits for use in making carbon for gas masks in 1918.
Letters have been received by this office and by the club boys and girls asking us to collect peach, plum, prune, cherry, and apricot pits as well as all kinds of nut shells for use in making carbon for gas masks. These pits should be dried in the sun and then deposited in some central place in each community, the school house probably being the best place. The teacher can then notify me when a quantity has been collected and arrangements can be made for bringing the collection to Madras so that it may be shipped out. One of the fruits of Kultur is poison gas which blinds and kills our soldiers. The carbon made from fruit pits and nut shells neutralizes it. Two hundred peach pits or seven pounds of nuts produce enough carbon for one gas mask. Let us see to it that not a fruit pit nor a nut shell goes to waste in Jefferson County. This is a work in which the smallest child may take part. Preliminary phase of Oregon's new liquor rationing program — validation of purchasers' permits — was launched yesterday. The new quantity permits, which will guarantee each purchaser a quart or fifth of whiskey and a quart or fifth of gin, brandy or rum monthly, become effective Oct. 1. But two weeks of validating purchasers' permits through presentation of war ration book No. 3 will, the state liquor control commission hopes, clear the boards of paper work in time for getting down to the real business by the end of the month. No more purchasers' permits will be sold unless the war ration books are presented. The picture tubes on television sets using the UHF signal from the Jefferson County Television Inc. translator station will be dark Wednesday evening, Sept. 25, starting at 7:30 p.m., Roy Stevenson, president of the nonprofit corporation, announced Wednesday. The station will be turned off at that hour, he said. The reason is that corporation officials feel they can get better attendance at the second session of the annual meeting, scheduled for 8 p.m. Attendance couldn't be any worse that at the meeting scheduled for Sept. 11. At that time, despite the fact that letters were sent to 650 known users of the UHF signal, a total of six persons, including officers and directors of the corporation, showed up. With such poor attendance, Stevenson said, no business could be transacted. It is hoped that at the Sept. 25 meeting, recessed from the earlier session, a director can be elected, a budget adopted, and other business transacted. "Be there and state your views," was the message Stevenson had for users of the translator. He said that the station would be turned back on by a vote at the Sept. 25 meeting. 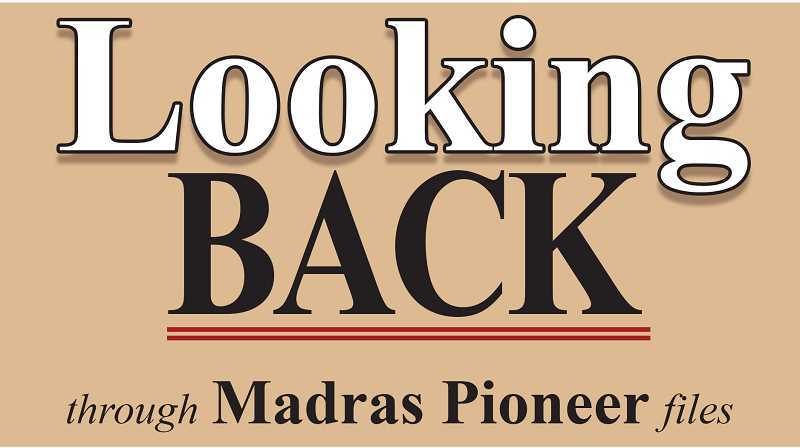 One of the best histories of early-day Madras came about when the Methodist Church celebrated its heritage from 1905 to 1984. If ever a building was built on faith, that was it. In 1905, there were no churches at all in the town site. There was no electricity and no water system. As William and Rachel Ellis drove down the grade from Agency Plains into town, Mr. Ellis told his wife that the place would soon see the last of him. It was just a few houses along dirt streets. There were no sidewalks, and just a store or two with hitching racks for horses. Luckily for the town, his prediction did not come true. They took up a homestead near Round Butte and later moved into town. Rachel set up a Sunday school in the school building. There were no telephones, but news could be spread by meeting people at the well, which supplied both the townspeople and those on outlying ranches. Very soon after getting the Sunday school going, there was a need for some kind of musical instrument. Word was received that a secondhand, foot-powered organ was available in The Dalles for $35. The money was donated and Mr. Ellis, with the aid of C.L. Lowther, made the trip of several days each way to get the organ with money donated by the congregation. This was in December and it was a cold, miserable trip.